With these words Yolande Mukagasana, a Tutsi nurse who escaped the genocide, introduces her rescuer in her book “Death does not want me”. In real life, Emmanuelle is Jacqueline Mukansonera, a young ethnic Hutu, who had come to Yolande’s surgery in Kigali’s Nyamirambo district for treatment. From the very beginning of the genocide, Yolande was one of the prime targets on the Hutu extremists’ death list, condemned for being part of the Tutsi intelligentsia. Jacqueline concealed Yolande in her kitchen, under a double concrete sink, where she remained hidden for 11 days, emerging only at night to eat and stretch her cramped limbs. The two women dared not even speak to each other, for fear of discovery. To ensure Yolande’s safety, Jacqueline bribed a policeman and procured false papers identifying her as an ethnic Hutu. Today Jacqueline lives in Rwanda, where she continues her struggle for human rights and where she formed the “Jya Mubandi Mwana” association, in aid of severely disabled children. 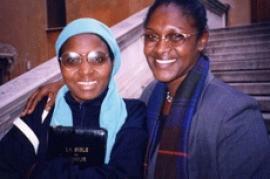 In 1998 in Bolzano, Jacqueline Mukansonera and Yolande Mukagasana received the “Alexander Langer” Testimonial Award. The stated motives for the prize underlined the fact that, although the two women hardly knew each other, they immediately established a relationship based on human solidarity. At the risk of her own life, Jacqueline took it upon herself to save Yolande from certain death, demonstrating that even in the most brutal and extreme circumstances, there is room for individual action and responsibility. For Yolande the prize is motivated by the fact that, despite having suffered the brutal extermination of her entire family, she fought for survival with astounding courage, determined as well to denounce what had happened to the world so that the genocide would not be forgotten, so that those responsible would not go unpunished and, above all, so that such crimes would never be repeated. Such examples of individual bravery and extreme selflessness clearly have an essential part to play. No less essential, however, is a personal commitment on the part of individuals at large so that – in their political actions – countries may be inspired by the shared values acknowledged in the constitutional acts of the international community.